Every once in a while we get calls about sycamore trees that have lost their leaves and appear to be dead. …our customers ask? It’s a logical question since most of these trees certainly appear to have come to the end of the line, but many times they are suffering from a case of anthracnose—a rarely fatal fungal disease that often just needs to run its course before the tree returns to its normal growth cycle. The calls from customers start coming in for these cases late in the spring when they first notice their trees are sprouting withered leaves and losing them rapidly. (Calls are especially prevalent if it’s been a cool, wet spring when anthracnose is most common and customers suspect their trees have frost damage.) They continue to come in as the trees remain barren through the summer and owners decide they are beyond repair. But if anthracnose is the culprit, no such drastic measures are necessary. Be patient.While the tree may appear to be dead it will probably recover and develop new leaves and shoots. Practice good garden sanitation by raking up and disposing of fallen leaves and twigs. Practice good cultural techniques to keep plants healthy and free of drought, nutritional or injury-induced stress. Water trees twice a month during dry winters. Prune out dead branches when possible. Disinfect pruning shears in a 10-percent bleach solution between cuts to avoid spreading the disease. Prune branches to improve air circulation reducing the length of time leaves are wet and thus susceptible to infection. Plant resistant species or cultivars. 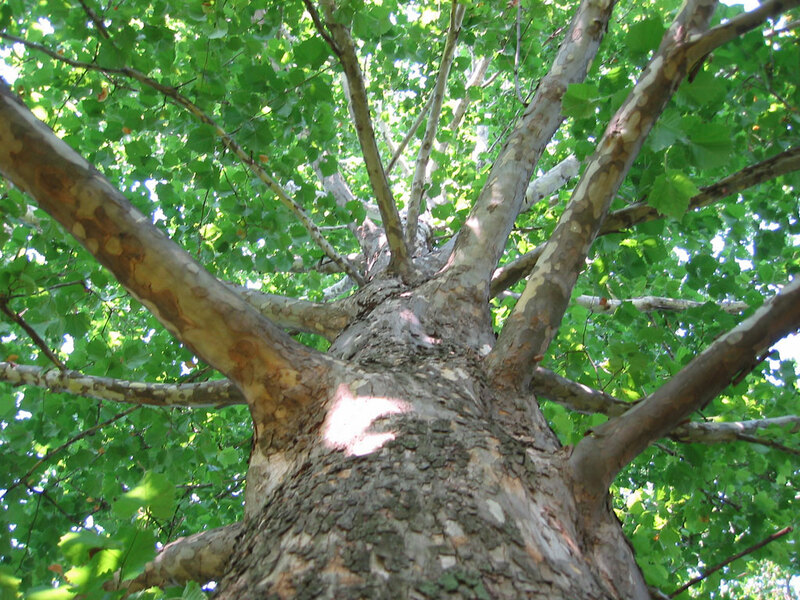 Oriental plane tree (zones 7-9) and London plane tree cultivars, Bloodgood, Columbia and Liberty are less susceptible to the disease than the American sycamore. One thing to note, however, is that while anthracnose isn’t often deadly for your tree, it can and likely will cause some aesthetic damage. Some of the tree’s twigs and older branches may develop cankers, and a few may even die. Clusters of these dead twigs can lead to abnormal branching and cause the tree to appear ragged, and you also may see some black dots caused by the fungus. With pruning, however, the appearance may be salvaged, depending on the severity of the disease If you have a sycamore that has been affected by anthracnose and want to evaluate it with a professional, we at Grade-A Tree Care will be glad to assist you. We employ arborists who can examine your tree and help you make the best decision for its future. If it needs trimming, we’ll be happy to take on the task, and if you do want it removed, we can handle that for you as well. But if all goes well, you’ll find that it’s not as deadly as it seemed and that your tree can be restored to provide you years of shade and beauty. I totally agree with the 1st strategy! Be patient with it. Can’t count how many times people started to get worried and wanting to do stuff to the tree, to somehow revive it. Sometimes you just have to give it some time and let the nature do it’s thing. Great article! Thanks.